Visit www.lakesideohio.com/woodenboatshow for more information. Visit www.lakesideohio.com/admission for admission and parking rates. 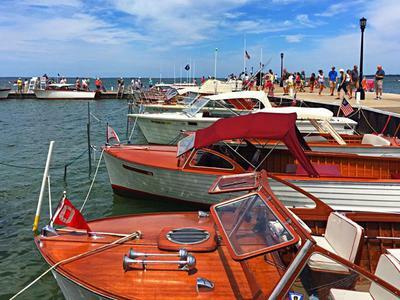 The 2019 Lakeside Wooden Boat Show & Plein Air Art Festival will take place from 12-4 p.m. Sunday, July 21 in Lakeside, Ohio. Lakeside is located halfway between Cleveland and Toledo on the Marblehead Peninsula. This unique event along Lake Erie features more than 80 wooden boats from across the region, as well as 30 plein air artists with one-of-a-kind paintings for sale, live entertainment with Wally & the Beavs, food, children’s painting, and much more. The show is coordinated by the Lakeside Wooden Boat Society. To register a wooden boat, contact Wooden Boat Show Coordinator Mame Drackett at mame@drackett.cc or (239) 776-6205. For more information about Lakeside, visit www.lakesideohio.com/woodenboatshow.